Dispensing with all the other problems with that issue, one wonders how many people might get the idea that the law really already is in effect and thus abide accordingly. I mean, I guess it would be up to the goodwill of those empowered with enforcement to give up the gag before the damage is done right? One wonders when exactly that might occur? After said individual absent an ID walks out of the polls? Its their fault they can’t hear the “Oh shucks, just kidding!” all the way from the parking lot? 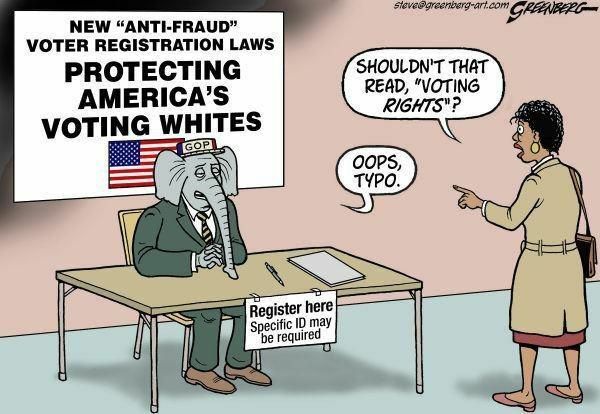 Well, basically the Union Leader chooses to overlook that problem, while of course having to make the odd construction that Democrats were protesting the Voter ID law by refusing to give up their ID’s, that oh wait! really isn’t a law yet. Bet that’s a first. But its all good right? No one lost their voting privileges that day right? Nope not at all, unless you talked to people who went to the polls, who were confronted with the patently illegal signage that wards had no business posting that led people to believe that the law was in fact in effect. Nope not all unless you talk to the people who knowing their rights, refused to produce an ID and were not given the Voter Challenge Affidavit until after they had surrendered their ID. Funny thing, guess the workers at the polls need some more training, including those poll watchers. Or the person who, in the case of one person in Manchester who has a strong Spanish accent, of being further humiliated by having to answer to the question, “Where are you from?” So much for that old folksy New Hampshire. Let’s just dispel that right now. Manchester is a city, just like Nashua and Portsmouth. There aren’t docile dairy cows roaming between white clapboard farmhouses or farmers with red and black checkered hunting caps leaning on fences saying “Ahyup!”. Unlike the charmed sentiment of the editor, New Hampshire has had its influx of newcomers, of which many who don’t fit the New Hampshire ideal citizen, aren’t exactly given the welcome mat and a pint of New Hampshire maple syrup. But of course these folks mostly settle in the larger communities and their participation in the polls just might change some things up old Concord way. Never mind that the other segment of voters that the those at the Union Leader editorial board and Keepers of All That is White and Right in New Hampshire also probably only fret about property taxes in the sense that they know they are paying too much and there’s a small segment of large landowners not paying their fair share. They’d probably vote Democratic, just a hunch, but since that conversation has only occurred on a meaningful basis within the Democratic party, one might safely conclude that. Much better to keep those folks home and why wait until November when the Voter ID law becomes an actual law, how about have a practice run, heck what could it hurt if this election some folks don’t turn up or go home without getting to exercise their right to perform the most important civic duty in the nation. In the accompanying report on how the practice run went, it is explained that those who did in fact challenge the law will be chased down by mail, then if there’s a letter sent back they’ll send agents out we assume to track these people down and the Secretary of State’s office will pour over each and every affidavit to verify whether the voter exists or not. Looks like the Secretary of State’s office will be hiring folks pretty soon. Amazing how that works; legislation that grows government comes from an administration that claims to do just the opposite. Guess the work will be done by special little Fairies for Freedom, to find those practically non-existent fraudulent voters. But what about the people who walked away from the polls unable to vote? What does that do to our election? Uh-oh, thinking too much. In the Union Leader/Republican world those little people don’t matter and the results. We just gotta live with it, because dammit, there are brown people, poor people, aged, students and disabled folks who we know vote overwhelmingly Democrat and who cares if they stay home? Of course the richest misunderstanding of the law is encapsulated by the editorial writer’s comment, “Well, the constitution gives qualified voters the right to vote.” Yup, that’s right and there’s nothing in the constitution about presenting an ID. More than likely the framers never envisioned a system would develop in which certain individuals would work and live in this country and not be eligible to vote — oh wait! We tried that too didn’t we? How did that work out? One has to wonder, with all the fervor that never seems to end about “qualifying” voters, what exactly is the motive? Could it be that not only a threat exists from the millions of truly “qualified” citizens actually exercising their right to vote enmasse, what would happen if those who fall between the cracks of citizenship, living, working and contributing to businesses and the economy, like the many that work in Manchester, Nashua and elsewhere in the state starting suddenly voting? Yes, its a scary thought indeed.